This flycatcher(? ), singing us back up from a walk on the beach this morning is probably my favourite photo (bigger here), but shipwrecks, a giant starfish, an epic sunset (as mentioned here), some mice, plenty of fun on the beach – and yes – an octopus in a rock pool (seriously), will have to compete with one another for top spot in the memories category. 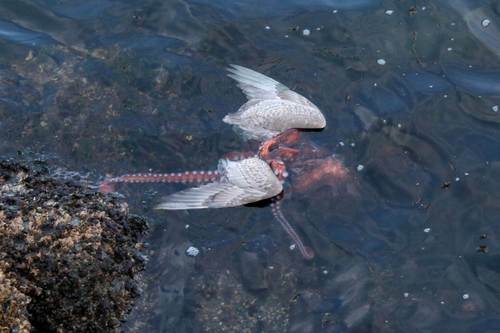 We’ve all had that cheeky seagull have a pop at our chips or our ice cream, but this time, the boot is on the other tentacle, as a juvenile glaucous-winged gull ends up being lunch for a Giant Pacific Octopus. The event, witnessed by Ginger Morneau, her husband Ken, and brother Lou Baker at Ogden Point Breakwater in Victoria, British Columbia, is rare, but not unheard of, and is described in full here. 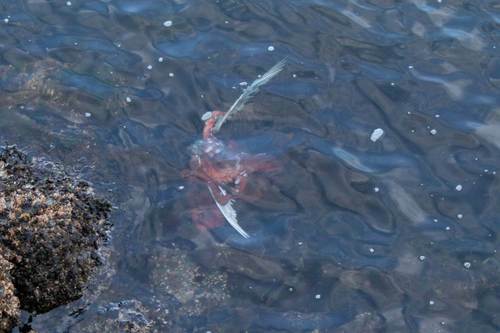 The Giant Pacific Octopus can be seen regularly patrolling the shallows of the shorelines around Victoria. 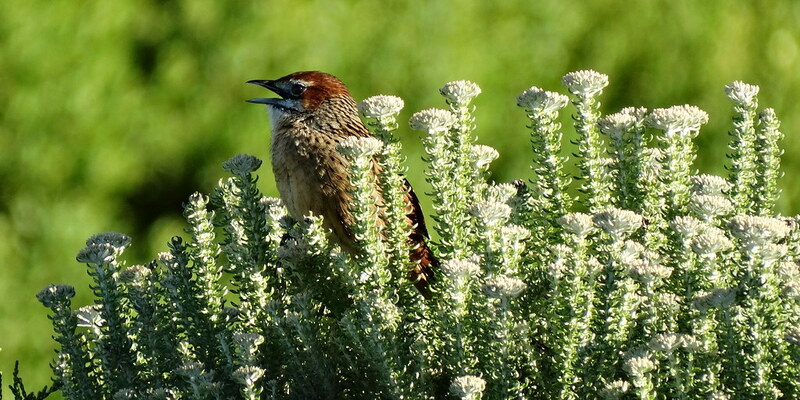 They primarily feed on crustaceans, but are known to occasionally take fish and even birds. Octopi are extremely intelligent animals, and great problem solvers. Although they live only about four years, they can grow to have a span of more than 20 feet and to weigh more than 100 pounds. This one wasn’t that large, but it was still an impressive individual. What was even more impressive, though, was that it had one of its tentacles wrapped around the head of the gull, holding it under water. 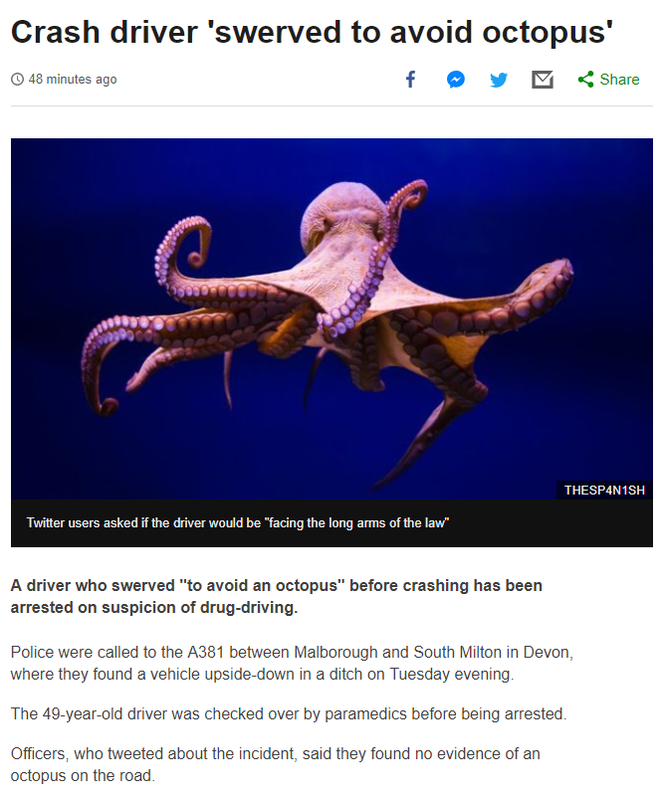 It’s likely that the gull may even have been picking and pecking at the octopus before the tables were turned. Bear that in mind next time you’re devouring a supposedly harmless pizza. It may just rear up and bite back. Or… er… not. Seriously – there could be one right behind you right now. As Mr Nash would say: Mind. Blown.